It is recommended that you perform searches on successfully compiled programs to ensure the accuracy of search results. It is important to familiarize yourself with the correct search syntax to use to complete an effective search. It is also important to ensure that include paths and symbols are correctly defined. For more information, see Setting up include paths and macros for C/C++ indexer. Highlight the element you want to search. Right click and select Search For from the context menu. 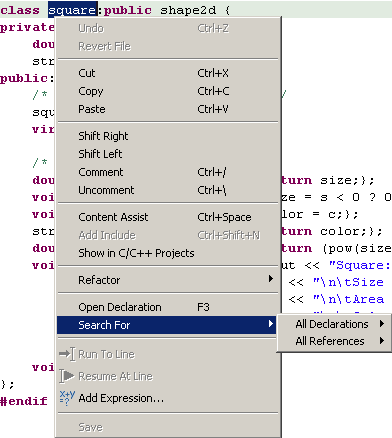 Select All Declarations or All References.